Pulp cooking refers to the process of pulping that put the papermaking raw material and the cooking liquor into the digester and then heat by steam to remove the non-cellulose part of the fiber material. 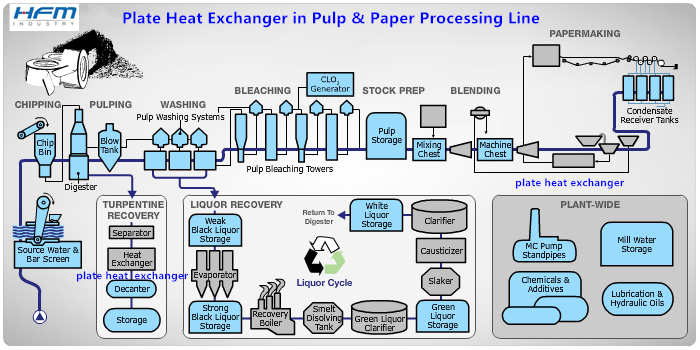 Papermaking boiled black liquor with a high calorific value and good flammability is an important self-produced energy of the paper industry. Hofmann's products can be used as a series of key energy-saving equipment in the black liquor enrichment process, which is an important measure to improve the energy utilization and environmental protection of paper mills. Heat exchangers are the essential parts for pulp & paper mills. With the help of heat exchangers, paper mills benefits a lot either in energy saving or environment protecting. There are many ways for a paper mill to utilize heat exchangers, nowadays especially plate heat exchangers, which are small space-taking, high efficient heat recovery, easy maintenance and economical cost. In essence, the paper processing line, starting from wood pulp processing and refining and then goes into the bleaching and cleaning before the paper formation, is all done with the help of heat exchanger. Specifically, plate heat exchangers are used to heat the liquids used to create pulp from wood, a process involving chemical compounds that pull apart the wood structure, leaving a goopy like substance that can be formed into paper after more processing. Secondary processes involve blenching or drying the pulp, which is a process also heated by plate heat exchangers. After the desired color is achieved, the pulp becomes paper by way of a paper machine, which knits the pulp into thin webs that form sheets. During which all the moisture is removed and some style of blower is used to dry it out completely. One part of the paper machine also uses a type of heat exchanger known as a waste heat recovery system, which is one of the ways that heat exchangers are able to save energy, resources and money for a paper mill. 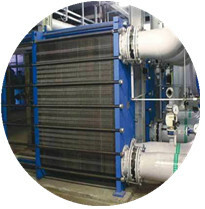 A waste heat recovery machine is a recycling system. It is able to absorb the heat and moisture in a room to be reused without putting a greater strain on the energy source that usually provides air and water for the paper processing.